Hygge (pronounced hue-guh) is a Danish word used when acknowledging a feeling or moment, whether ordinary or extraordinary, as cosy, charming or special. 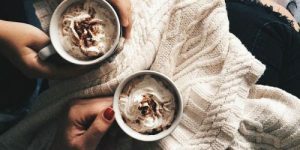 Hygge is all about atmosphere, presence, pleasure, equality, gratitude, harmony, comfort, truce, togetherness and shelter. Which are all qualities that are already found in yoga and fit perfectly within the setting of a yoga retreat. On Thursday 16th November we set off for our three day Yoga and Hygge Luxury Escape, and with only one double room left (could you be the lucky yogi, couple or friends joining us on this luxury escape? ), we wanted to let you know what we will be getting up to during our time away. Thursday: Students arrive and Angela and Lara will be on hand to show everyone to their atmospheric rooms — think fresh flowers and Scandinavian style wood burners — or to one of our hygge style sleep nests to catch some zzz’s. There will be freshly baked snacks and warming drinks served on arrival. Dinner will be a warming, tasty veggie meal with an emphasis on Scandinavian flavours. We will wrap up the first evening with a candle lit Hygge inspired Yoga Nidra with NEOM products to prepare you for a good nights sleep. Friday morning: Soothing Flow class followed by breakfast and some time to yourself to explore the surrounding area — perhaps one of our recommended walks? — treat yourself to a sauna, use the outdoor hot tub (yoga kula are on hand to supply you with face packs and scrubs to sooth and nourish winter skin) or simply relax in your room or in one of hygge style sleep nests. Later on there’ll be Restorative Yoga and the chance for a warm oil massage or Mizen therapy (when pre-booked). 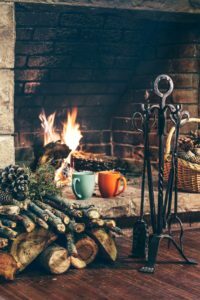 Dinner on Friday evening will be followed by chatting, yogic stories and kirtan around the fire pit with warm wine, hot chocolate and cosy blankets — hygge style. Saturday morning: a Dynamic Hatha and Hygge Yin class will be followed by breakfast and some time to yourself for walks, one on one yoga classes, therapies (please pre-book both of these in advance) or even a game of tennis. Saturday afternoon will consist of lunch and Somatic Yoga. In the evening we’ll sit down for a gorgeous vegetarian dinner with organic wine and local cheeses before we end the evening with a cacao ceremony, meditation and deep relaxation. We’ll begin Sunday with a cosy Hatha Yoga class followed by a green smoothie boost. There will then be time to mindfully pack and say our goodbyes before we check out late on Sunday morning. For anyone who wants to prolong the escape we’ll be heading to the stylish Stydd Garden Centre, Ribchester for an early lunch before heading home feeling refreshed. We are incredibly excited about our first luxury escape, it’s going to be a great experience for all of us to take deep rest, self inquiry and spend time with like minded people. At Kula we love to create, innovate and delight, and we hope you enjoy this weekend! Hurry the final room won’t be available for long!